Puerto Vallarta, Mexico - Do you enjoy great food, fantastic sunsets, first class entertainment and amazing art from a world class artist? Are you interested in helping children with disabilities? We have the perfect event for you! 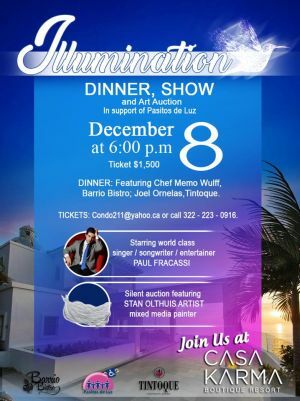 Join us at Casa Karma Boutique Hotel on Friday, December 8, 2017, from 6 to 10 pm for the Pasitos de Luz Illumination Dinner, Show and Art Auction. Watching the sun as it sets across the ocean from the amazing Casa Karma venue is always an exhilarating and special moment - and this fabulous event with a cause will make it even more enjoyable! Dinner will feature chefs from renowned restaurants Barrio Bistro and Tintoque who are collaborating to bring you the taste sensations in which they excel. The Show will feature world class talent Paul Fracassi, a former finalist on Canadian Idol, who will illuminate the evening! His brilliant tributes to legendary singers will help make the evening come alive. His feel-good renditions of artists such as Elvis, Frankie Valli, Frank Sinatra and many more are guaranteed to leave you wanting more. The Silent Art Auction will feature a large portfolio of paintings generously donated by a world-renowned artist Stan Olthuis. You can see some of his work at Stanolthuis.com. The art work is currently on display at Casa Connor, where you can also visit the children of Pasitos de Luz. More information about advance viewing and advance bidding will be available soon. All proceeds go to the Pasitos de Luz children at Casa Connor. Our mission is to enhance the quality and create lasting change in the lives of children with disabilities in Banderas Bay. Pasitos is a registered non-profit charity that provides a lifeline for more than 112 families with a goal of reaching 200 families by 2020. The children we serve come largely from impoverished families and suffer from acute physical and/or psychological illnesses. We offer a large range of services free of charge, including physical therapy, psychological care, nutrition and wellness, education programs and so much more. You can become a part of this by supporting our events. Join us at a Casa Karma on December 8th and wear something with white to support the Pasitos community of light. Tickets cost $1500 pesos and are available by contacting Barb at condo211(at)yahoo.ca, or visiting us at our table at the Olas Altas Farmers' Market on November 18th and 25th. The Illumination Dinner, Show and Art Auction will provide you with an evening you won't soon forget. Get your tickets TODAY! For more information, visit the Facebook event page.